Former prime minister and senior politician Tulsi Giri, 93, passed on Tuesday morning at his own residence in Bdhanilkantha. Giri was ill and he had stopped meeting people since a long. Of late, he was admitted at the Medicity Hospital in Saibu, Bhaisepati. When medical doctors observing Giri saw no hope on his recovery, he was discharged from the hospital and brought back to his home. 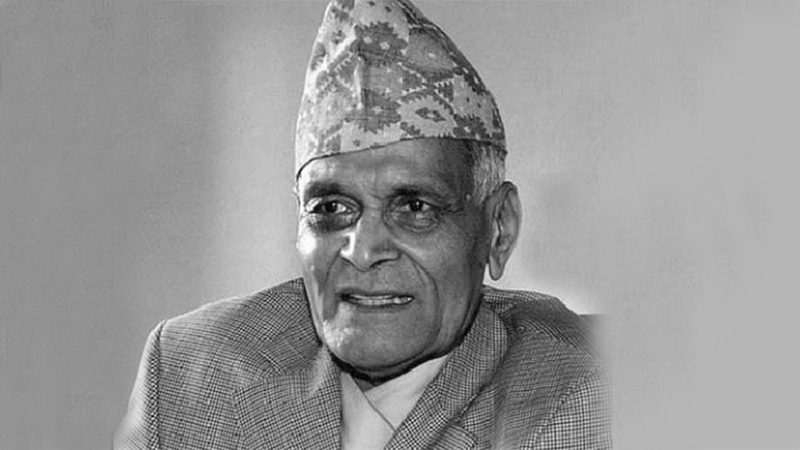 Giri was the Prime Minister of Nepal from 1975 to 1977, and chairman of the Council of Ministers in 1963, and again in 1964 and 1965. He was born in Siraha District, Nepal in 1926. Giri was also a Minister in the Congress government of 1959-1960, before its dissolution by King Mahendra. He was also the vice-chairman of the council of ministers in the cabinet under the then king Gyanendra Bikram Shah. He is survived by his wife, two sons, and two daughters. Important chapter is closed: General secretary of the Nepali Congress and also a minister in the Nepali Congress government, Giri was one among the confidants of NC’s funding leader BP Koirala. When Giri was the minister, Sushil Koirala, who became NC president and also the prime minister of the country, was the personal secretary of Giri. Later, he closely supported King Mahendra while introducing partyless panchayat democracy and became strong advocate of the beauty of partyless system in the Nepali context. He didn’t change his stance about partyless system until his last hours. After adoption of improved Panchayat system by King Birendra following the referendum, Giri became frustrated and left the country for decades. He returned Nepal only after the then King Gyanendra assumed executive power. Later, he became vice chairman in the cabinet led by King Gyanendra. Giri was not happy from the compromise by King Gyanendra with the agitating leaders including Girija Prasad Koirala in April, 2006. In a meeting with this scribe, Giri had informed that he had tried to convince King Gyanendra for not giving up the executive power. However, King Gyanendra didn’t want to see bloodbath in the country, Giri had said. Again, Giri had requested to assign him executive role to tackle with the agitators, that request too was declined by the then King Gyanendra. Giri was a huge stock of references in the history of modern Nepal and along with his demise, an important chapter in the history has been closed forever. A patriotic leader: Giri was a patriotic leader and thus, he had become strong critic of the multiparty democracy. He had believed that the multiparty system in Nepal like country is not sustainable. Also, he saw threats from foreign elements while practicing multiparty democracy. He had the belief that a king can never be a foreign agent alike the political leaders. Giri’s demise is a great loss to the nation. People’s Review family prays to the Almighty for eternal peace of the departed soul and extends heartfelt condolences to the members of the bereaved family. Previous Missing 33 kg gold seized in Kolakta!